A young woman kidnapped in 1998 from a Florida hospital was reunited with her biological parents Saturday in South Carolina. 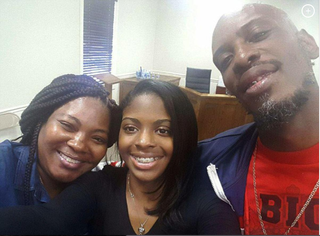 Kamiyah Mobley, 18, spent 45 minutes with her birth parents, Craig Aiken and Shanara Mobley, at the Walterboro Police Department, where the woman who kidnapped her is being held. The New York Daily News reports that Mobley grew up in rural South Carolina as a young girl named Alexis Manigo. Eighteen years ago, the woman she has always known as her mother posed as a hospital worker and stole her from a Jacksonville, Fla., hospital. She was only hours old. Gloria Williams, 51, was arrested Friday and charged with first-degree kidnapping after the National Center for Missing and Exploited Children passed along an anonymous tip to authorities. She faces up to life in prison if convicted on the charges. Williams reportedly suffered a miscarriage about a week before she drove from South Carolina to the Florida hospital where she abducted Mobley. The News reports that an anguished Mobley rushed to the detention center in Walterboro to see Williams, where she sobbed, “I love you, Momma,” as Williams was processed. It was there where she met her biological parents.